SecuryBrowse is a browser hijacker that causes constant redirects to commercial sites next to its seemingly-useful features. SecuryBrowse is a potentially unwanted program – a browser extension designed for Google Chrome. However, the infiltration technique of this PUP is rather interesting. It first gets installed via software bundling and then redirects users to trafficadvance.net which asks them to implement the extension. Once installed, SecuryBrowse virus will change homepage and the new tab URL to https://search.securybrowser.com and redirect all searches to Yahoo. While it's description sounds flashy – “Contextual Security Advisory based on browsing and search activity” the application is merely a browser hijacker which seeks monetary benefit from targeted advertising. Additionally, SecuryBrowse might provide users with a false sense of security due to its blocking of the allegedly dangerous sites. In reality, the app denies entry to websites based on keywords and not the actual threats. By downloading/installing “SECURYBROWSE”, you will be installing a software application onto your computer which might appear on your desktop or within one or more of your Internet browsers. 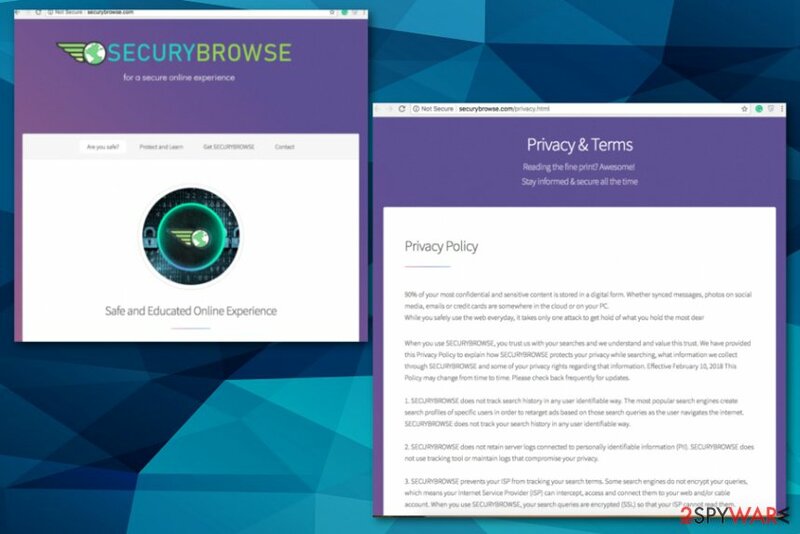 “SECURYBROWSE” products will allow you to search the Internet, and may provide you with additional features as further described in this EULA. During the download of a “SECURYBROWSE” Product you may also be offered the opportunity to set your browser homepage, start page, new tab page and/or default search setting(s) to our search service. 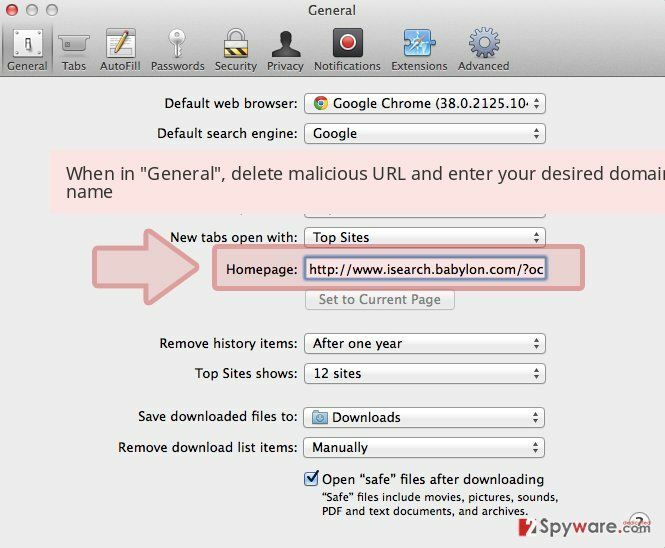 If your browser is redirecting you to various commercial sites and a default search engine or a start page was set to search.securybrowse.com, it is the first sign that you have a browser hijacker on your computer. While SecuryBrowse may seem useful, beware that it can track information related to your browsing. 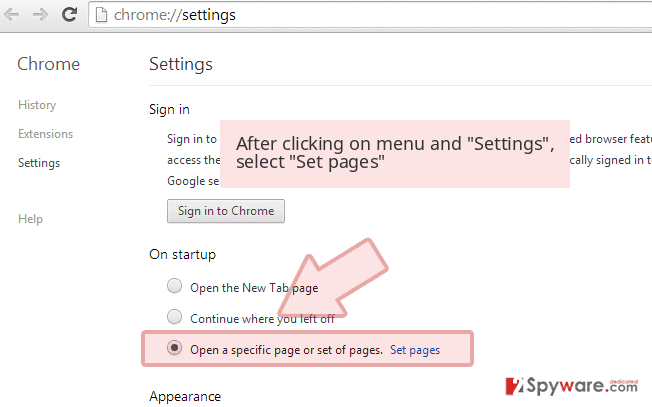 Remove SecuryBrowse virus if you notice that your homepage and new tab options were changed. At the moment, the PUP is attacking Google Chrome web browser. However, there is no guarantee that other browsers won't be affected as well. The easiest way to fix your computer is to run a full system scan with anti-malware tools like Reimage. SecuryBrowse removal is important to do and the sooner you do that, the better. The more time this browser hijacker spends on your system, the more unwanted changes you may find out. This is not the program that can change significant parts of the system, but there is a possibility that the PUP can redirect you to highly questionable sites. 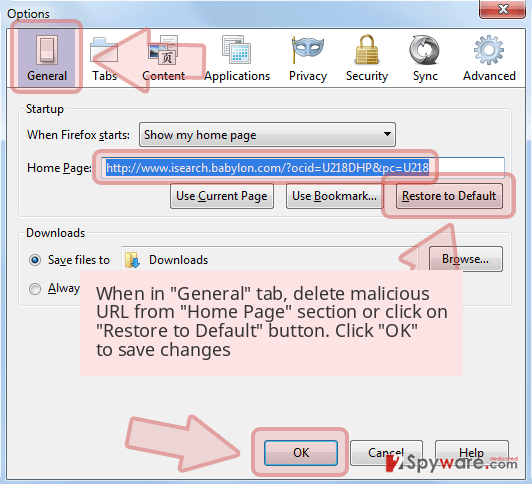 SecuryBrowse is a program that can modify your browser settings. There are two ways used by this PUP to enter the system. First of all, you can get it from its official site as a great addition to your web browser. However, you can also discover it on your system without downloading it. This method is known as bundling as it hides optional components in a software which is completely safe and legitimate. PUP developers typically make arrangements with freeware providers and rely on software bundling technique to spread their PUPs without a warning. If you do not wish to reset your setting(s), you can decline/opt-out of the setting(s) change by unchecking the appropriate checkbox during the download process for the relevant “SECURYBROWSE” Product. Skipping through these important steps can lead you to numerous changes in web browsers. Make sure you choose Advanced or Custom installation settings that will help you to see the whole list of additions. To remove SecuryBrowse virus from your computer, you need to use reputable anti-malware tools. It is the easiest way to check the system for unwanted components that may be hiding in the background. However, make sure you use only reputable software and use it only after updating to its latest version. In the future, it will help you to detect all potential threats and before they manage to enter your device. 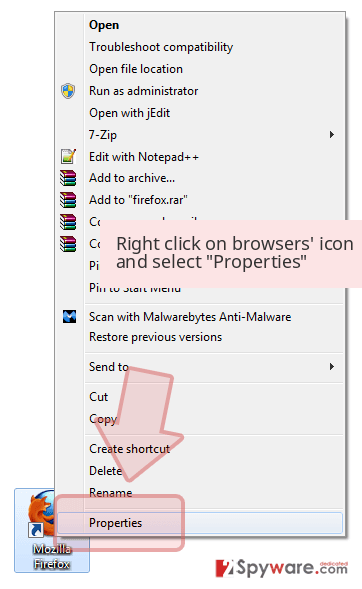 Proper SecuryBrowse removal also requires resetting your web browser to its previous state. Potentially unwanted programs tend to renew themselves after rebooting the computer, so make sure you fully perform PUP's removal from the system. Here, look for SecuryBrowse or any other recently installed suspicious programs. Wait until you see Applications folder and look for SecuryBrowse or any other suspicious programs on it. Now right click on every of such entries and select Move to Trash. When in the new window, check Delete personal settings and select Reset again to complete SecuryBrowse removal. Once these steps are finished, SecuryBrowse should be removed from your Microsoft Edge browser. Here, select SecuryBrowse and other questionable plugins. Click Remove to delete these entries. Now you will see Reset Firefox to its default state message with Reset Firefox button. Click this button for several times and complete SecuryBrowse removal. Here, select SecuryBrowse and other malicious plugins and select trash icon to delete these entries. Click Reset to confirm this action and complete SecuryBrowse removal. 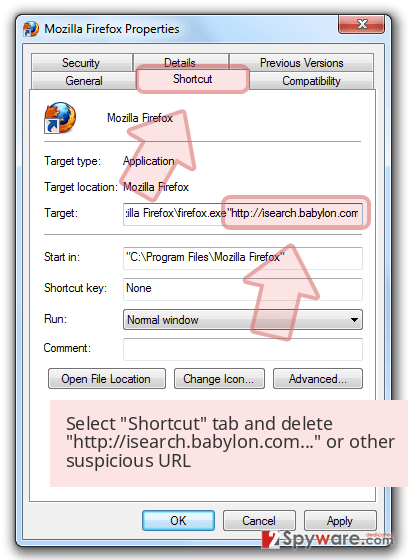 Here, select Extensions and look for SecuryBrowse or other suspicious entries. Click on the Uninstall button to get rid each of them. Here, look at the Homepage field. If it was altered by SecuryBrowse, remove unwanted link and enter the one that you want to use for your searches. Remember to include the "http://" before typing in the address of the page. Now you will see a detailed dialog window filled with reset options. All of those options are usually checked, but you can specify which of them you want to reset. Click the Reset button to complete SecuryBrowse removal process. ^ Browser hijacking. Techopedia. IT and business education. 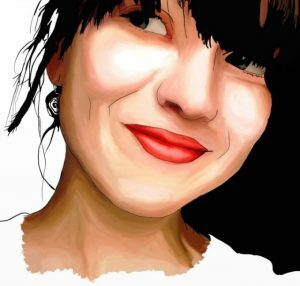 This entry was posted on 2019-02-01 at 06:49 and is filed under Browser Hijackers, Viruses. You can quickly scan the QR code with your mobile device and have SecuryBrowse manual removal instructions right in your pocket. How did you remove SecuryBrowse?